Hurricane Irene still poses a major threat for the Northeast coast, but her effects on Edisto amounted to strong winds, intense currents, and a storm surge that rushed over Palmetto Boulevard and down the side streets. 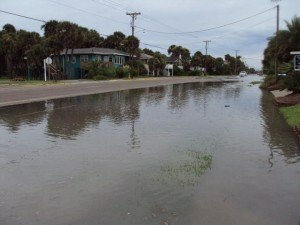 Irene remained more than 250 miles off the coast of South Carolina, but managed to create rain bands and strong winds. The power went off intermittently on the island due to the winds, but luckily did not stay off for long. It wasnt until high tide rolled in just after six pm that the storm surge started to creep up higher and higher until it pooled around the pilings of many front row homes and spilled into the roadways. Throughout the day, the waves were much larger than usual and hammered away at the coast. While many people already left Edisto or cancelled vacation plans, the people who did remain came out to witness the floods. Some people took their hurricane parties outside and stood in knee-deep puddles while drinking a beer, others kayaked down Palmetto Blvd. Saturday should be windy and partly cloudy with temperatures in the mid-90s. High tide will occur around five in the morning and the lingering storm surge will most likely cause additional flooding of Palmetto Blvd. Rip currents will still be prevalent and everyone is urged to take precautions before entering the water. Rip currents have the ability to pull swimmers out to sea quickly. If you get caught in a rip current, swim parallel to shore and wait until the suction ends before trying to swim back to the beach. Also note that the waves will continue to be larger than normal due to the strong winds, so use extreme caution before attempting to swim. Seas are reported as high as 10-15 feet so small watercraft are urged to stay in port until Sunday. Remember that hurricane season lasts into November, so always be prepared. I am so glad there was no more damadge than you had, it would be truly a shame to have such a wonderful place torn up by a storm like that. As you can tell we took our Vacation in Edisto this year.. first time there and not the last, we fell in love with that laidback little piece of beach heaven. With retirement only about 18 yrs away i see your population going up by two. Good lord willing and the creek don't rise. Thank you for this update. We plan to be @Edisto in Sept 17- 24 looking forward to the trip. Best regards to everyone and please stay safe. 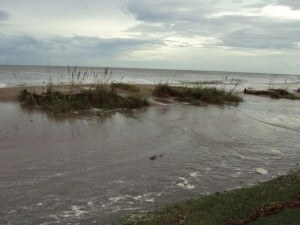 Good to know that Edisto Beach has been spared the hardest brunt of Irene. We just finished another week long vacation on the beach (8/20) and were praying that our favorite beach would be okay.